Glow-in-the-Dark Products stay illuminated for 10 hours. 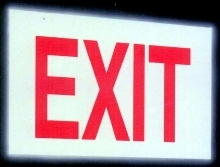 During power outages or other situations where lights are off, SetonGlo(TM) Photoluminescent Fire and Exit Signs help employees find their way out while avoiding hazardous equipment, situations, and materials. Signs are available in aluminum, plastic, and self-adhesive materials in various sizes. SetonGlo tapes are offered in stripes, solids, and V- and arrow-styles. Glow-in-the-dark aisle marking arrows, dots, and footprints are also available. Light the Way to Safety with SetonGlo(TM) Ten Hour Plus Glow-In-The-Dark Products! Branford, CT - A production facility can be a dangerous place when the lights go out. Employees need to find their way out while avoiding potentially hazardous equipment, situations and materials. Seton is helping people stay safe during power outages and other emergencies with its line of SetonGlo(TM) Photoluminescent Fire & Exit Signs. The SetonGlo(TM) signs are available in aluminum, plastic and self-adhesive materials in a variety of sizes. In addition to signs, Seton offers other photoluminescent materials that comply with multiple safety standards and glow for ten plus hours. These products include glow-in-the-dark aisle marking arrows, dots and footprints. SetonGlo(TM) tapes are also available in stripes, solids and V- and arrow-styles for low-level marking. For more information on Seton health and safety signs, as well as a complete online product catalog, visit www.seton.com or call 1-800-243-6624. Seton is an international manufacturer of over 50,000 safety and facility identification products for manufacturing, construction, healthcare, telecommunication, electrical, and other markets.